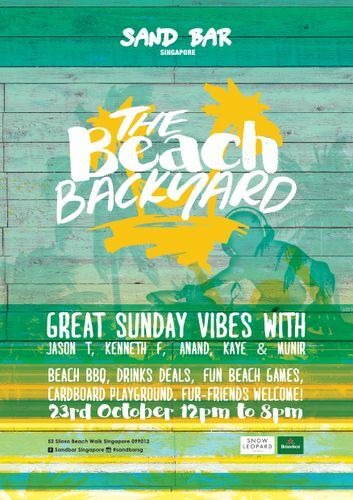 Join Sand Bar and Snow Leopard Vodka for a fun-filled afternoon of sizzling barbecue feasting, live music, exciting games and great Sunday vibes at the third edition of the Beach Backyard on 23 October from 12pm to 8pm. Friends, family and fur-kids can look forward to a day of fun and frolic by the beach with Sand Bar's line-up of outdoor activities - from beer pong and beach bowling games for the adults to a special cardboard playground for the little ones, complete with beach toys to play with and chalkboards to doodle on. Sip on delicious cocktails at the Snow Leopard Vodka booth all for a great cause. With each purchase of the Snow Leopard Vodka drinks, $2 from sales proceeds will go towards the conservation efforts of International Snow Leopard Trust. Additionally, donate $5 to the cause and receive an adorable Snow Leopard stuffed toy. Hot on The Beach Backyard’s live all-you-can-eat barbecue is Sand Bar’s delectable spread of fresh seafood, meats, salads and sweet treats at $48 per person. Fancy something lighter? Tuck into Sand Bar's tasty beach bites ranging from $10 to $18. Enjoy great drink promotions such as Beer Buckets (Desperados or Hoegaarden) at $36, house wines at $10 per glass and many more. Setting the perfect tone for the day are groovy tunes by some of Singapore’s talented DJs including Sand Bar’s resident Jason Teo, guest DJ Kenneth Francis and DJ Anand. Also adding eclectic sounds to the music mix are a live saxophonist and guitarist. There is no better place to be on Sunday but at The Beach Backyard at Sand Bar!